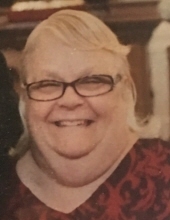 Winona “Gail” (Sisco) Brown, 64, of Springcrest Apartments, passed away Saturday, January 19, 2019 at her residence. Ms. Brown was born on May 19, 1954 in California, a daughter of the late Troy Riley and Doris Gail (Williams) Sisco. Winona enjoyed playing pool, listening to music, spending time with her family, and she loved her cats. She is survived by two daughters, Colleen B. Price and her husband George R., Jr. of Staunton, and Cathleen “Cathy” L. Price of Stuarts Draft; a brother, Troy Wayne Sisco; a sister, Dianna S. Day both of Texas; five grandchildren, Eva Genee` Brown, Hunter Price and his wife Stephanie, Walker Price, Autumn Price, and Dakota Price; and her special and devoted friend, Justin E. Knott. A Memorial service will be conducted 2:00 p.m. Thursday, January 24, 2019 in the Coffman Funeral Home Chapel by Pastor Kevin Persinger. The family will receive friends following the service at Calvary Assembly of God, 1516 Springhill Road, Staunton, Virginia. To send flowers or a remembrance gift to the family of Gail (Sisco) Brown, please visit our Tribute Store. "Email Address" would like to share the life celebration of Gail (Sisco) Brown. Click on the "link" to go to share a favorite memory or leave a condolence message for the family.